There you go, that title pretty much sums up my approach to science fiction. Yeah, we're not necessarily talking about the hardest of hard sci-fi, here. Granted, I may have sat down and worked out their evolutionary path, to give them some semblance of verisimilitude, but when you get right down to it, right down to the very nub, it all came down to me wanting a squid race in there. See that pic, just there? Yes, I can finally say that I'm a legitimate published author, thanks to the sheer magic that is ebooks. 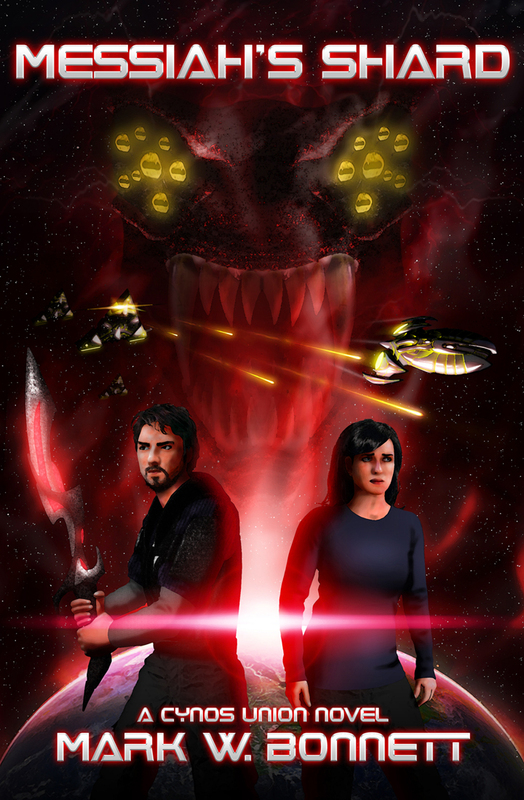 My first novel, Messiah's Shard, is available on Kindle and Smashwords (with more to come), and let me tell you, it's a damned fine feeling, so it is! It doesn't end with that first novel, though, no sirree bobby. Y'see, this story's been kicking about in my head since I was a young'n, and over the years, it's grown and evolved into something way bigger than the mewling little pseudopodal thingie that it began life as. As it grew, and as the universe in which it was set got bigger and bigger, I realised that it'd ceased to be just a standalone story. There was a whole universe there, ripe for the plundering. And so, the Cynos Union was born. So basically, what I'm saying, right, is to expect lots more Cynos Union novels after this one. I'll also be publishing exclusive stories and content on my Facebook fan page, so wander over there, and give that Like button a good, hard clicking. There's character profiles, exclusive prequels... hell, maybe some giveaways, too, from time to time! Oh, and if you're wondering, that squidly race? Yeah, that's the yowason. They're vampire space squids. Messiah's Shard is available to buy now! Subscribe for more news from the world (and brain) of Mark W. Bonnett! The Blog Fiction Collection - exclusive stories, not available in shops!